The new “Halloween” movie made $US77.5 million over the weekend, a franchise best and the second-biggest horror movie opening of all time. Exhibitor Relations box-office analyst Jeff Bock noted that nostalgia could have been a big factor in the movie’s success, as it brings back original “Halloween” star Jamie Lee Curtis and director John Carpenter, who produced and scored the new film. It signals a trend that has worked for Hollywood before, and could be applied to future horror movies. The new “Halloween” movie murdered the box office this weekend with $US77.5 million, the biggest opening weekend for a horror movie of the year, the second-biggest opening for a horror movie of all time, and the biggest opening in the “Halloween” franchise. It was also close to the recent October opening weekend record holder, “Venom,” which made $US80 million earlier this month. Needless to say, “Halloween,” from film studio Blumhouse, is a hit with audiences. 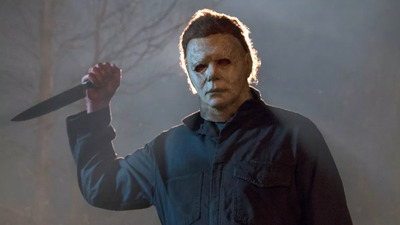 It continues a trend for the horror genre the last two years, which has seen hit after hit, with “Get Out,” “It,” “A Quiet Place,” and most recently “The Nun.” But in regards to “Halloween,” there may have been bigger forces at play than just the horror factor. Exhibitor Relations senior box-office analyst Jeff Bock told Business Insider that the “nostalgia factor” helped “Halloween” make big money, and it could signal a Hollywood trend. Bock told Business Insider in September, before the release of “The Predator,” that the movie would disappoint financially because it missed an opportunity to include the original movie’s star, Arnold Schwarzenegger, who declined an appearance because the role was too small. Lowballing Schwarzenegger did prove to be a mistake, as the movie failed to generate box-office success. “Halloween,” meanwhile, brought back familiar franchise star Jamie Lee Curtis and acted as a direct sequel to John Carpenter’s 1978 original (Carpenter even returned to produce and score the film). With “The Nun” a box-office smash just a month ago, audiences weren’t lacking in horror. But the familiarity of the “Halloween” name with an original star and creator attached helped attract moviegoers. Nostalgia has helped franchise films win big at the box office before, and two of the biggest movies of the last few years capitalised on that. “Star Wars: The Force Awakens” brought back original stars Harrison Ford and Carrie Fisher and featured a similar plot to the original movie, not unlike “Halloween.” “Jurassic World” completed the promise of Steven Spielberg’s “Jurassic Park” by being set at a fully functioning dinosaur theme park. Disney has also found success in remaking its classic animated films into live-action blockbusters. “Alice in Wonderland,” “The Jungle Book,” and “Beauty and the Beast” all made over or close to $US1 billion worldwide. Nostalgia certainly played a factor there, as adults who grew up with those movies could enjoy them just as well as a new generation could. “Aladdin” and “The Lion King” are expected to arrive in theatres next year. The next potential blockbuster that will rely on this strategy is next year’s “Terminator” movie from “Deadpool” director Tim Miller. Not only is Schwarzenegger returning, but original star Linda Hamilton is, as well. But the horror genre has rarely used nostalgia to its advantage like other genres have. It’s something that the last two movies in the “Halloween” franchise, Rob Zombie’s 2007 reboot and its 2009 sequel (along with many of the horror remakes of the 2000s) failed to do. The new “Halloween” has already grossed more worldwide than either of those movies did. Ridley Scott has attempted to revive his “Alien” franchise in recent years with prequels like “Prometheus” and “Alien: Covenant,” but those movies underperformed in the US. “District 9” director Neill Blomkamp was at one point attached to direct an “Alien” movie that would have taken place after “Aliens” and ignored later, disappointing sequels, which is very similar to what the new “Halloween” movie did. That movie was ultimately canceled, but what if original franchise star Sigourney Weaver returned? What would audience enthusiasm look like now if that movie was still on track? The next “Conjuring” movie, an “Annabelle” sequel, is bringing back “The Conjuring” stars Patrick Wilson and Vera Farmiga, which may produce a higher box-office take. With the success of “Halloween,” it wouldn’t be surprising to see future horror movies try to tap into the nostalgia of their respective franchises.